NEW EDITION with a new chapter (No. 11) on 'Easy Trig Solutions in Degrees'. See 'Preface' and 'Contents' tabs below. This book shows an original and highly effective way of unifying many branches of mathematics using Pythagorean triples. A simple, elegant method for combining these triples gives unexpected and powerful general methods for solving a wide range of mathematical problems. There are applications in trigonometry (you do not need any of those complicated formulae), coordinate geometry (2 and 3 dimensions), transformations (2 and 3 dimensions), simple harmonic motion, astronomy etc., etc. I bought your books on Triples and Astronomical Applications. I am at the moment pursuing the book on triples. I like it very much. In fact I noticed the mathematics of addition , subtraction of angles using triples. It makes the laborious proofs and steps needed for the derivations using coordinate geometry (as is usually done nowadays) look superfluous. It is so simple and easy to understand. It is simply enjoyable. Thanks for all the ideas you have put forth because it has opened up vast vistas for imagination. Raji Sharma, Vedic Maths teacher, India. If you are attracted to the beauty and simplicity of Mathematics, and if you are drawn to the elegant patterns within Pythagorean Triples then this book will take you on an amazing voyage of discovery. Following the introduction of a few simple arithmetic methods for working with triples, there follows a host of traditional mathematical topics worked using the new 'triple' method. The efficiency and elegance of the mathematics is often breathtaking. Solutions which traditionally may take many steps of complex algebra just fall out in a few straightforward applications of the triple method. 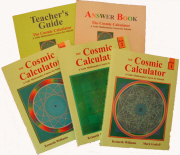 At the core of the book is Mathematics from the Indian Vedic culture (c2000 BC to c600 AD). This is a new territory for me (and I suspect for most) but is a departure that I found refreshing and stimulating. I thoroughly recommend this text for anyone with a knowledge of Mathematics at approximately A Level standard and a love for the beauty of the subject. The unchanging laws of number have always been a source of delight and inspiration. Particularly attractive are the Pythagorean triples which have so many elegant and interesting properties. But these triples are also of great practical use: through the theorem of Pythagoras the triples link the three main branches of mathematics: number, algebra and geometry. This appears to be the first time that these triples have been developed into a useful structure, having applications in trigonometry, transformations in 2 and 3 dimensions, coordinate geometry in 2 and 3 dimensions, solution of triangles and equations, complex numbers, hyperbolic functions, simple harmonic motion, astronomy etc. Many more applications are also likely to appear. This book shows how the triples (and their 3-dimensional equivalent, quadruples) can be developed and applied and how they form a unifying thread linking many areas of mathematics. In this latest edition of the book (2017) the chapter on Hyperbolic Functions has been replaced by a chapter on Easy Trig Solutions in Degrees. This shows how we can get a good first estimate of trig functions and their inverses (to at least 2 significant figures) and is therefore of practical use. The entire book has been reformatted and many minor modifications made. This book also serves as an illustration of Vedic Mathematics: a mathematical system which has been rediscovered by Sri Bharati Krsna Tirthaji (1884-1960) from ancient Vedic texts and is expounded in his book (see Reference 1). This system is based on sixteen formulae which are said to give one line answers to all mathematical problems. Being based on fundamental principles these Vedic formulae are therefore conspicuous in any structure that is developed in a simple and natural way. As the triples idea is introduced and extended in this book the operation of these formulae is evident. The formulae are expressed in word form (for example, By One More than the One Before) and as they arise in the text they are indicated by italic type. An index of these formulae will be found at the end of the book. The diagram below gives a guide as to how the chapters in this book depend upon each other, so that Chapter 8 for example, can be understood by first reading only Chapters 1, 2 and 6.
reveals unexpected applications in many areas of pure and applied mathematics. The easy triple method links these areas and replaces large numbers of apparently unconnected formulae with a single device. This book fully explains the various applications and most of it should be accessible to anyone with the basic understanding of mathematics which a school leaver should have. countries to give seminars and courses. He gives online courses, including teacher training. Research includes left-to-right calculating, Astronomy, applications of Triples, extension of Tirthaji's 'Crowning Gem', Calculus.